We did it!! I feel like we’re part of an elite club. The Marathon Club. Jeremy did awesome. He beat Oprah by 3 seconds, which, he says, is enough for him to be done with marathons. Had his potty break lasted any longer I thing he might be considering running another one. 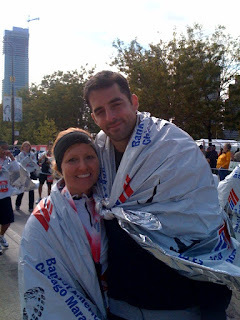 The first thing I said when I crossed the finish line of the Chicago Marathon (and several times before) was, “I am never doing this *&*#$^ thing again!” Thank God I don’t know how to time travel. If mile 24 Tamara had been able to go back and talk to mile 2 Tamara I’m not sure I would have finished the race. Then again, maybe I could have just fast forward to post marathon Tamara and skipped the whole thing all together. What would I have to brag about then? It’s probably best not to mess with the space-time continuum. I cannot describe the pain and fear I experienced from about mile 21-26.2. (I’m pretty sure I can handle child birth now.) Every ounce of my body was screaming to stop except for my stupid brain, which got me into this whole mess to begin with, and would not be happy until it dragged my battered body across the finish line. My saving grace was in the form of my awesome running buddy, Rebecca, who listened to my pathetic cursing of the marathon the entire last 5 miles of the race. We each had inspiration quotes to tell each other when it got tough. I know she probably couldn’t tell from my reaction, (I had perma-scowl for the last hour and a half of running) but they really did help. One pivotal point for me in the race came at mile 23. Keep in mind I was mentally tracking every footstep between me and the finish line. I was certain I passed mile 22 forever ago when I heard a man over a loud speaker saying, “Way to go runners! Looking great! You’re nearly at mile 22! !” Panic immediately ensued. I turned to Rebecca in what must have been an expression of shear terror and said, “22?! I do not have 4.2 more miles in me!? !” She promptly alleviated my horror and said, “No!! This is mile 23!! We only have 3.2! !” I could wrap my brain around 3.2, and so, we went on. 0.2 miles from the finish line I’m sure we looked like an odd pair: Rebecca doing air punches to “Eye of the Tiger” playing over loud speakers; and me with my head down talking to myself about how much I hate running. Eventually we crossed the finish line together! Rebecca and I have gone back and forth on who benefitted more from our partnership. I insist that I never would have finished that race if she would not have been there to encourage me; she says she never would have run the race if I had not encouraged her. There’s probably truth to both of those statements. I’m just so happy to have run my first marathon with her by my side. She truly is a wonderful friend. The best moment of the entire race was with out a doubt when Jeremy and I spotted each other just beyond the finish line. Nylon blanket clad with finisher metals hung around our necks we hobbled to each others arms. He looked so proud of me. I never felt better! All of our hours of training, leaving parties early or not attending at all so we could get up and run in the morning, our laughs and tiffs on the trail, our injuries and our accomplishments were all worth it. We are marathoners.